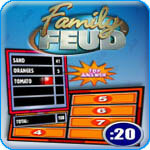 Family Feud Online Party Game - Download and Play Free Version! Play Family Feud Online Party With Anyone, Anywhere, Anytime! Match Your Trivia Skills With the Rest of the World Online! Now you can enjoy the popular, fast-paced television game show LIVE over the internet with people across the entire world! It's the same classic game you know and love - try to guess the top five or six answers to a variety of general survey questions asked to 100 people - but now it's a whole new ballgame! Meet funny, interesting people who have at least one thing in common with you: a passion for playing Family Feud Online Party! Fun and Challenging Family Feud Gameplay! Family Feud Online Party perfectly simulates the exciting experience of being a contestant on the famous game show. 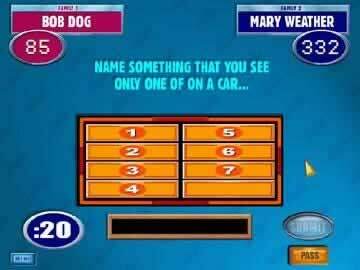 Just like you see on TV, get your answers in before time runs out. Earn points for a correct answer, a strike for something that's not on the board. If you get three strikes or all the right answers, the round is over. Play through the rounds and advance to the bonus rounds for a chance at the grand prize! You can win games and earn rewards to help your character build themselves a luxurious mansion. The action is fast-paced, challenging, and fun! There's also multiple ways to enjoy Family Feud Online Party with people from around the world. Join a team and feel the camaraderie and fellowship that comes with working together to achieve a goal. For a more personal experience, go head-to-head against just one other person in a one-on-one battle for Family Feud glory! In both game modes, you always have the option to chat with your teammates and opponents. Team players and solo artists, Family Feud Online Party has the multiplayer style for you. Great way to entertain family and friends! No matter what, Family Feud Online Party is a great game for all ages. The questions and answers are all family friendly and fun, and there's a bank of over 8,000 unique questions and 20,000 answers. To make absolutely sure things are kept fresh, both questions and answers are regularly updated with new material. Realistic sound and graphics make you feel like you're on TV! Pass, play, steal, and strike! All the intense game show action is accompanied by music and audio commentary. The graphics of Family Feud Online Party are unassuming, functional, and effective. They don't get in the way of your ability to play; instead, they enhance it by carefully recreating the look and feel of Family Feud, the game show! 100 people were asked the simple survey question, "What's the most fun online trivia game where you have a great time playing and meeting new people?" 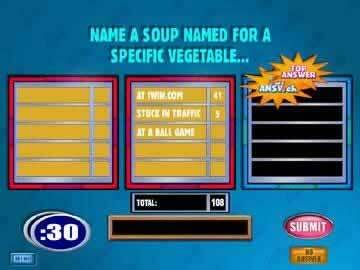 and the top answer was Family Feud Online Party!